Rallies are planned across San Diego in protest of the Trump Administration's hotly debated border policy. 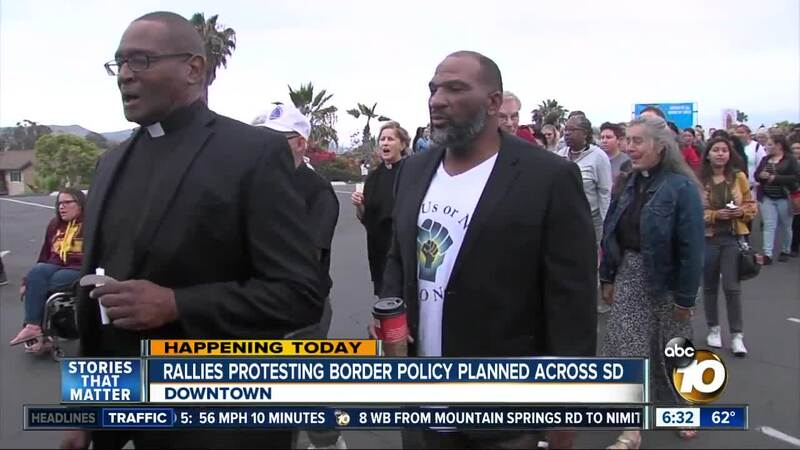 SAN DIEGO (KGTV) - Critics of the Trump Administration's border policy are set to gather in downtown San Diego to condemn the government's recent policies on illegal immigration. Thousands are expected to crowd San Diego's Civic Center Plaza at 10 a.m. Saturday for the "Families Belong Together" rally. Protestors were initially prepared to address the government's policy on separating families at the border. Now, after President Trump's executive order to keep families together, protesters will gather to call for reuniting those guardians separated from their children. Speakers will also address the administration's "zero-tolerance" border policy, for-profit private prisons, and questions over how to reunite families separated by the government. Protestors will march to downtown San Diego's Immigration and Customs Enforcement building. Another demonstration will be held in the South Bay, as hundreds of statewide faith leaders are expected to march to the Otay Mesa Detention Center at 1 p.m. Participating organizations include faith-based social justice groups PICO California and the San Diego Organizing Project. Bishop Robert McElroy, the Catholic diocese of San Diego; Father Neal Jose Wilkinson and Gloria Morales, both with the San Diego Organizing Project; are expected to attend. The march comes a day after U.S. Senator Kamala Harris visited the center, which she described as a "typical prison setting" and said rejecting Trump's zero-tolerance policy is akin to "fighting for the ideals of our country."